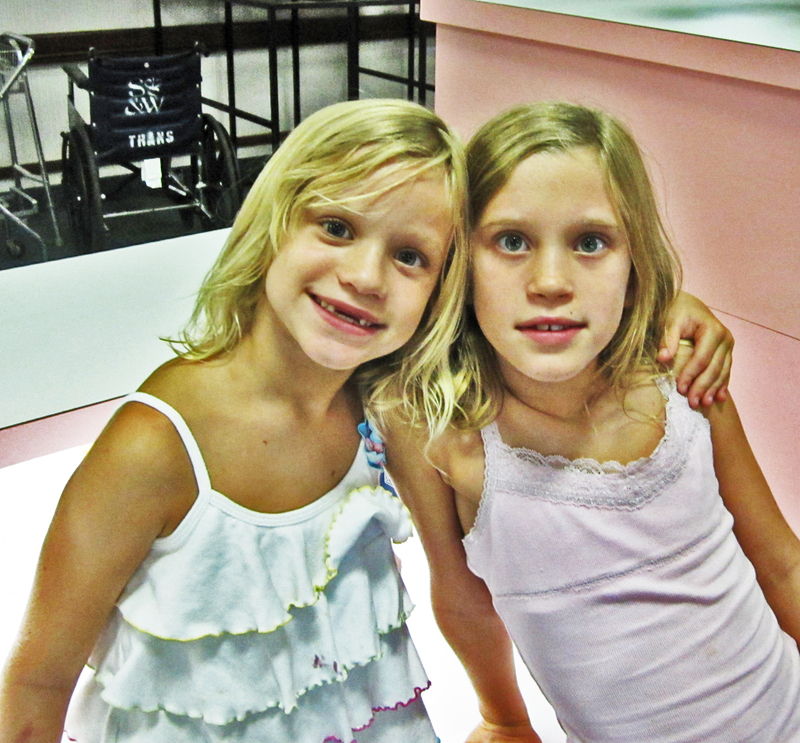 On 27 July 2011 while servicing a medical facility in the city of Cameron, Texas, it was my pleasure to be “pestered” by two vivacious and quite energetic young lasses named Ella and Jenna. Ella, in particular, repeatedly sneaked up behind me to deliver a good-natured jab in the back before turning and scooting away, out of reach. I reminded her, she told me, of her grandfather. Being myself a grandfather of three young lads — who, besides my wife of 43 years, our two sons and their lovely wives, and my gorgeous granddaughter Anna, are the source of many joys in my life — the interchange with Ella and her older sister Jenna was great fun. But all good things must end, and this brief interlude came to a temporary halt when it was time to go outside, in the 104°F heat, to inspect and conduct a preventive treatment for red imported fire ants (Solenopsis invicta). Later, sweat streaming down my face, it was time to go back inside to finish up the paperwork. There, while pulling the needed documents from my treatment cart, Ella sneaked up behind me once more. Looking down, my eyes caught sight of a tiny spider, with long crab-like legs, suspended on a fine line of silk. Aha! a thomisid crab spider! The kind that loves flowers, and this facility is surrounded, outside, by hundreds of flowering plants that today were adorned with a multitude of blossoms. A thomisid residing on one of those bushes must have hitched a ride on my back, probably after I’d brushed against one of the flower-bedecked fronds that extended across my path. The spider was now slowly descending toward the carpet, extruding more and more silk from its spinnerets to hasten its descent. With my left hand I reached down, caught the silken line, and pulled the spider up. Surprised by this sudden turn of events, the near-sighted arachnid scurried up its line to my fingers where — sensing it had come into direct contact with a large animal of some sort — it immediately dropped down a few inches and hovered there, as if pondering what to do next. Experience told me its next move would be to drop speedily to the floor, hoping thereby to escape. My right hand reached into the cart, withdrew a plastic container of specimen bottles, opened it up, and pulled one of the bottles out. She did so, and handed the open bottle over. As soon as the suspended spider was positioned directly over the bottle; a gentle tap of one of the fingers of my left hand goaded it into making the plunge, dropping it into the bottle’s gaping maw. Ella peered into the bottle to see the spider submerged in its clear liquid contents, then screwed the cap on for me. My reply was that, if I let the spider go inside the facility, someone would soon step on it, and if I tried to carry such a small specimen outside again, I’d probably kill it in the process. Another alternative was to drop it humanely in the bottle, which contained alcohol that would cause the spider to go to sleep. Later it would be examined back at the lab under the microscope. Then a few photos would be taken through the microscope’s lens, to be posted on bugsinthenews. And, provided her mother approved, a photo of her and sister Jenna, would be posted as well. Mom approved a few days later, after viewing the web page, and the photo of her daughters — attached to an e-mail I sent to her — that was in the plans to post. One can never be too careful about posting images of people on the Internet these days. Posting informative material here is my primary goal, but protecting individual privacy is an important adjunct of that work. Breaching the topic of science to an intelligent, inquisitive young lass opened the door to a lot of questions about biology (the study of living things), entomology (the study of insects), and arachnology (the study of spiders and their kin). There followed an invigorating discussion on all of these subjects, one that was difficult to end. But, well, as mentioned earlier, all good things must reach a terminus, and it was time for me to leave the captivating city of Cameron, Texas (one of the original 23 municipalities of the Texas Republic) behind until next month’s scheduled visit. So we said our goodbyes, and parted company. Back at the lab, the poor spider was pulled from its pickling solution, placed on a strip of absorbent paper, and allowed to dry off a bit. Once dry, it was moved to the stage of a dissecting microscope, and examined under magnification. Its striking crab-like habitus (general appearance) placed it firmly in the Thomisidae family of spiders. 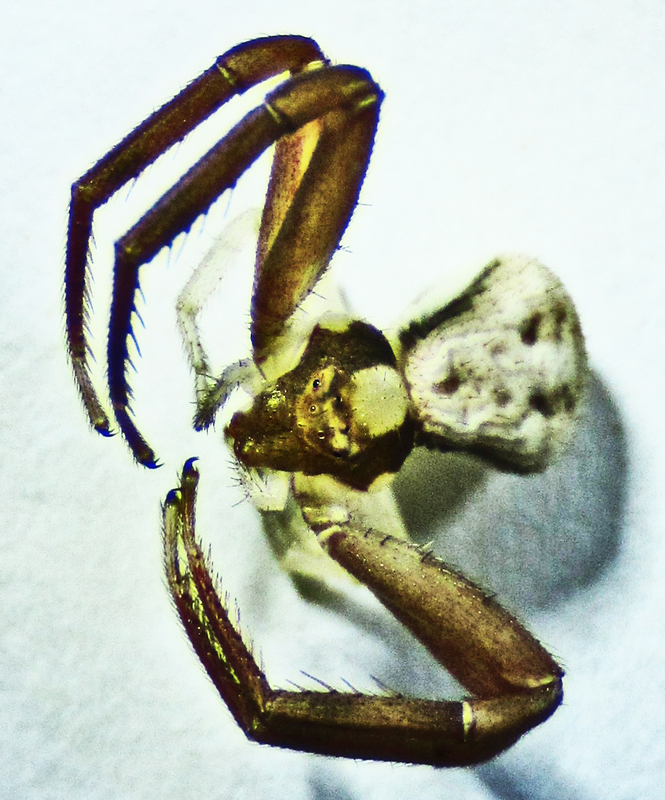 Only the Philodromidae — the running crab spiders — stand a chance of being mistaken for thomisids, and even they are easily distinguished from them in a single glance. Legs I and II of a thomisid are so dramatically stouter than legs III and IV, that they define the spider’s appearance; by comparison, all the legs of most philodromids are about the same size, though in some (the genus Ebo) leg II is much longer, and in no case do specific legs stand out as starkly as a thomisid’s first two pairs. 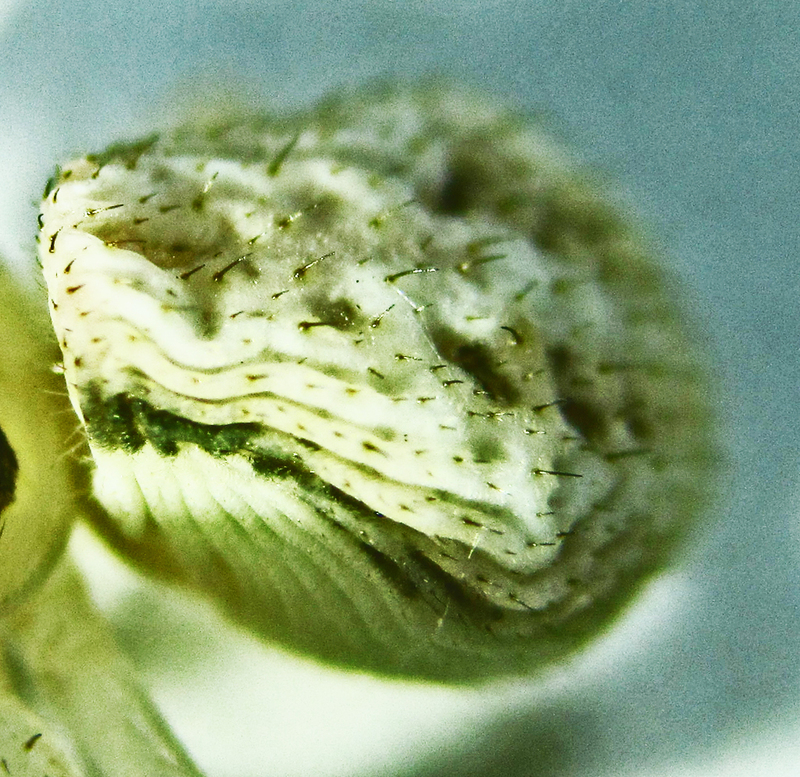 As might be suspected, philodromids are fast runners and rely on this faculty to catch prey. Thomisids, on the other hand, run poorly, and rely on stealth to ambush their prey, obviating the need for a chase. This particular spider is a female. 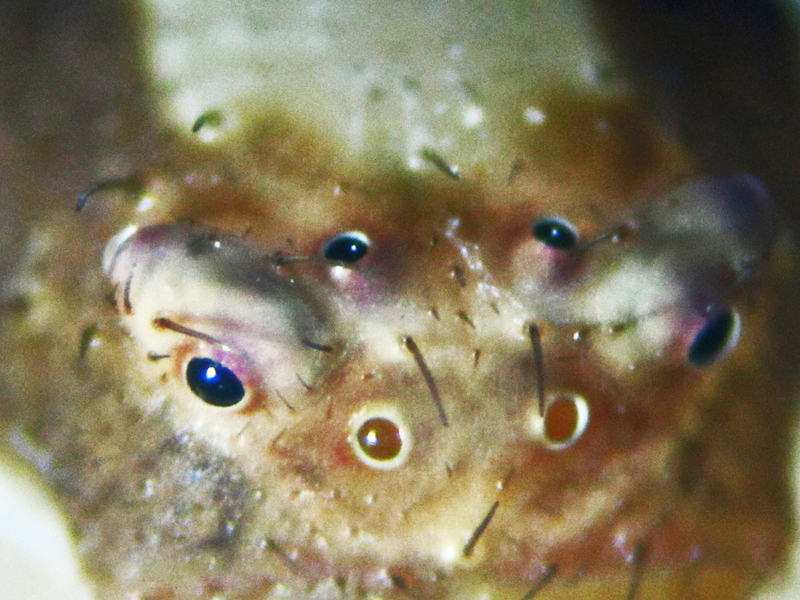 We know this not because the pedipalps (the diminutive leg-like structures on each side of the face, visible in fig. 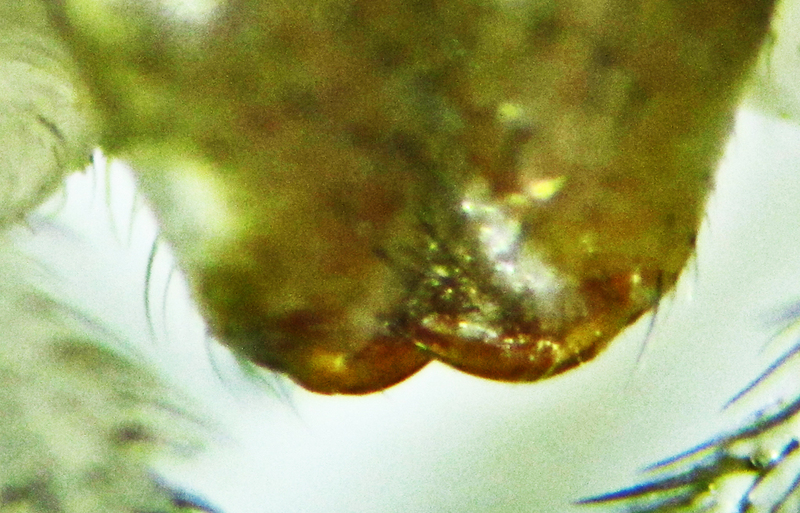 100, below) are not enlarged at the tips as most entelegyne male’s pedipalps would be; in this family the male’s pedipalps are indistinct (Ubick et al., 2005, p. 246). Instead we know this because the epigynum (fig. 103) is well defined and conforms to the morphology expected of a female thomisid, i.e., with a deep atrium, subdivided longitudinally by a median septum (ibid). Note that, as with all the photos posted on BugsInTheNews, these images may be enlarged for more detailed viewing by hovering your cursor over them and clicking. Thomisid or crab spiders are members of the family Thomisidae, whose familial name was assigned by the Swedish zoologist Carl Jacob Sundevall in 1833. He used a Greek word (θωμιξω, “thomiso” = a cord, or to bind), in reference to the adept use of silk by these spiders in their daily toils. That use, by the way, is confined to the construction of egg sacs and escape lines, as thomisids do not build silken nests. The Thomisidae family, worldwide, is presently grouped into some 170 genera, within which more than 2,000 species are known. All of these spiders are relatively small (from 1.5 to 11.5 mm), though the larger ones are moderately sized. 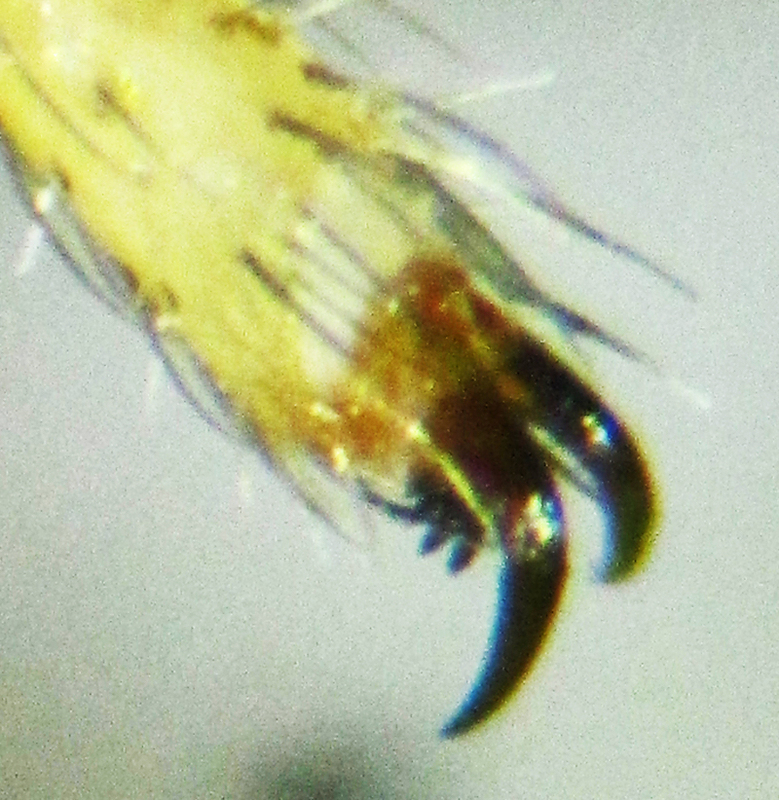 All thomisids have two claws on each tarsus, like the philodromids but without the claw tufts that adorn the tarsi of their more agile cousins. Apparently the need for such characters, which help the philodromids scale smooth vertical surfaces, is diminished or absent in phlegmatic ambushers such as the thomisids, whose time is mostly spent confined to the calyx of yellow and white flowers, waiting for tender morsels of food to buzz in, unaware — for reasons that will soon become clear — that the object of their attention is guarded by a hungry, voracious little spider. Their eight eyes are arranged in two transverse (extending across the face) rows, the lateral eyes perched on prominent tubercles. When we examine the eyes of Ella’s specimen, we find (see fig. 104) that the darkened background coloration is broken, first by a relatively wide, but discontinuous pale band that stretches across the face between the anterior and posterior median eyes (AME and PME), but that encloses the posterior lateral eyes (PLE). Next, beneath that pale band is a narrower one that stretches from just below the anterior lateral eyes (ALE), and forms the anterior border of the dark eye-mask of the face. 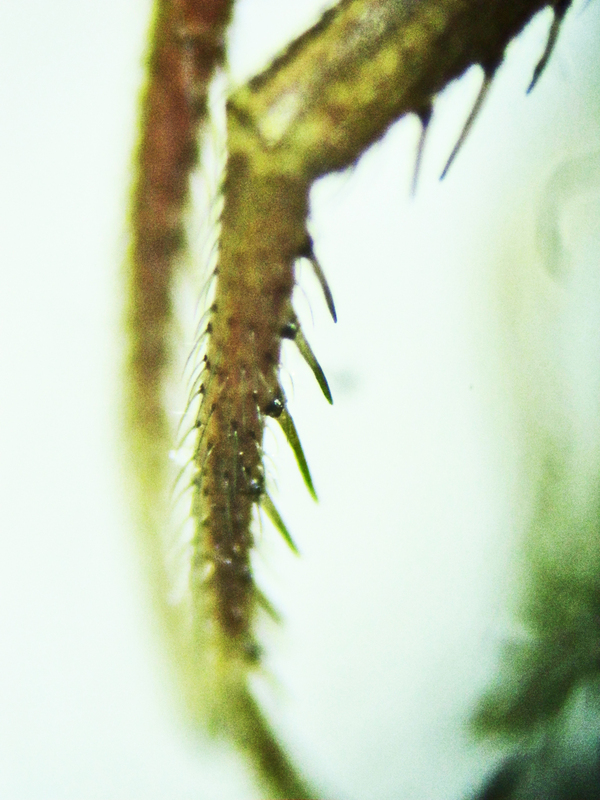 Thomisid jaws consist of short, thick chelicerae tapered distally (wide at the anterior clypeus, but narrowing toward the fangs). Willis John Gertsch points out that though their chelicerae are weak, and their fangs small, their venom is potent enough to quickly stun and kill large, otherwise dangerous insects such as bees and wasps (Gertsch, 1979, p. 208). 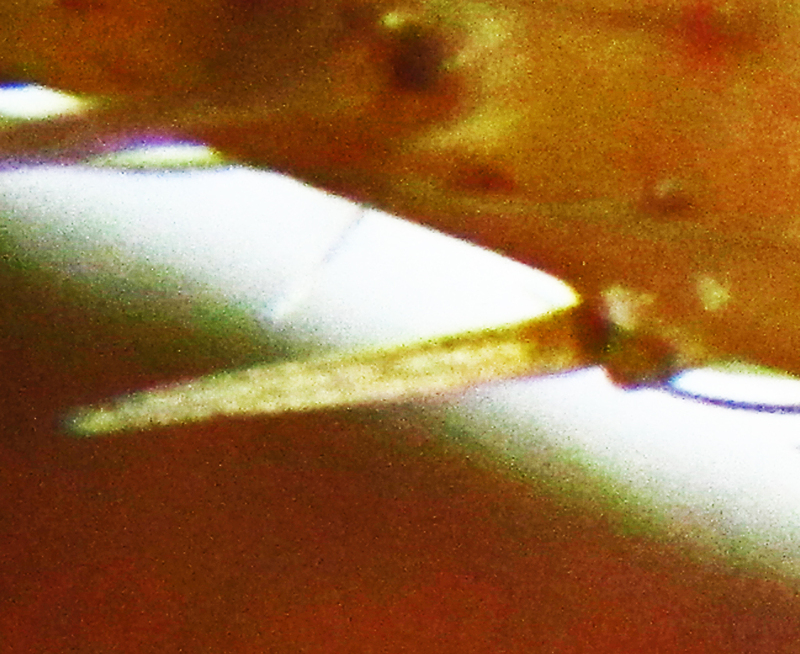 Legs I and II (which are dark brown or reddish for most thomisids) are much longer and stouter than legs III and IV (which are usually yellowish); as mentioned earlier, all four legs lack claw tufts and scopulae, but femur I often has several strong, erect macrosetae dorsally, a character that is also noted on tibia I, ventrally, of some genera (the object of this article, for example) as well. Studying this specimen was of special interest, because of my ongoing study of recluse spiders (in the Sicariidae family) and scorpions (Scorpiones: Buthidae) and the special relationship the thomisids have with both of those arachnids. All three of these families of arachnids have exceptionally low heart rates and metabolisms; all three are also ambushers, rather than active hunters; and all three tend to have longer than usual lifespans. We know, from studies at the EntomoBiotics lab, and those carried out by other investigators elsewhere, that recluse spiders and scorpions depend on a stimulent neutral environment to thrive, and that depriving them of such an environment — by, for example, adding habitat modifiers containing neuro-stimulating, non-toxic terpenes such as cinnamon, mint, and similar essential plant oils — to the ecological environ within which they forage and inhabit, tends to cut their lives short. The exact mechanisms involved are not fully known at present, though my tentative conclusion is that being forced to live in the presence of such stimulants makes it impossible for organisms like these to both (1) spend most of their time in the state of suspended animation needed to conserve precious energy resources, and (2) discriminate efficiently between the absence and presence of prey and predators. That last disability has a two-pronged impact on life-span, on one hand depriving them of needed prey, and on the other leaving them vulnerable to the machinations of predators bent on making a good meal of them. “I happened across the July 28 article on Misumenoides formosipes. My best guess based on the photos is that the pictures are of a female Mecaphesa (formerly the genus was called Misumenops, but the taxonomy has been shaken up recently – the name Mecaphesa has priority). Which species of Mecaphesa this is I do not know. There are a number of them in North America. The pictures are most definitely not of Misumenoides formosipes. 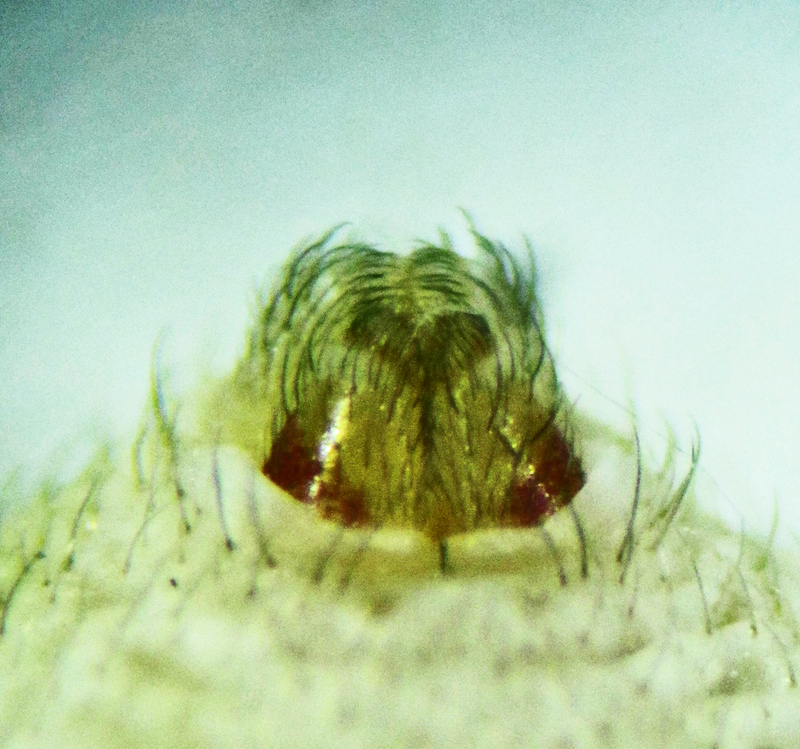 Misumenoides formosipes has a very distinct white clypeal carina (a thin white line running below the anterior row of eyes) – of course, when Misumenoides turns yellow, so does the clypeal carina (eventually). 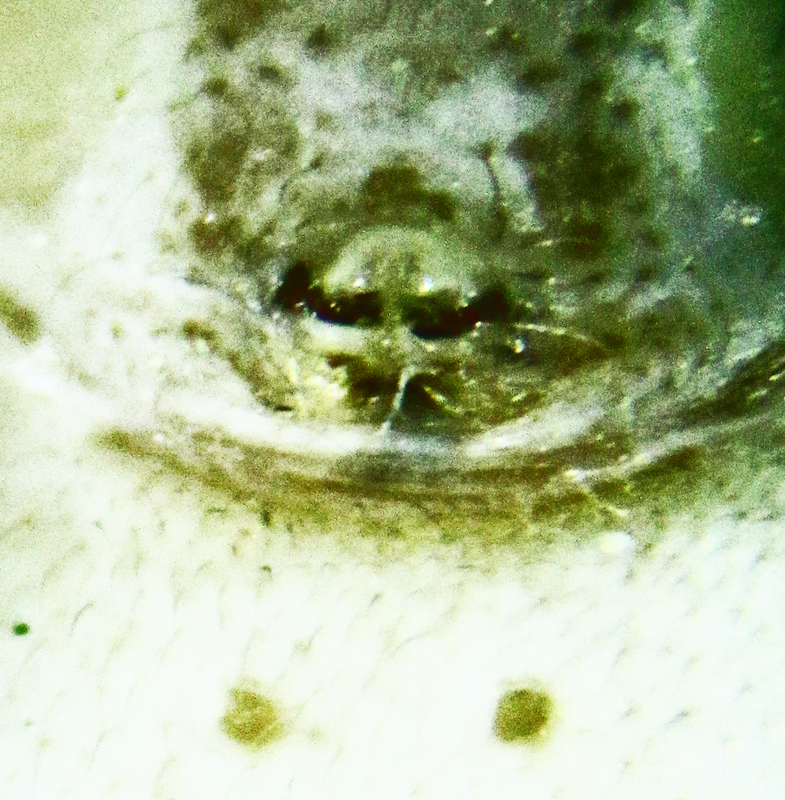 Also, the lateral eyes of Misumenoides formosipes do not protrude on tubercles the way the eyes of the spider in the photo do (Mecaphesa has prominent eye tubercles), and the spider in the photos is far too spinose to be Misumenoides (Mecaphesa has a lot of spines all over the body – Misumenoides is relatively “clean”). As Dr. Schmalhofer pointed out, arachnid taxonomy is routinely shaken up these days. The 2005 book by Ubick et al., Spiders of North America, needs major revisions already, due to the number of taxonomical “shakeups” that have taken place over the mere six years since its publication. One of these revisions was, as Schmalhofer wrote, occasioned by the redefinition of the genus Misumenops in 2008 by Lehtinen & Marusik. In that revision, many of the thomisid species previously assigned to the genus Misumenops were reassigned to the genus Mecaphesa. That latter genus was first described by the French arachnologist Eugène Simon (1848-1924) in 1900, when Simon was 52. The etiology of this generic name is not clear to me, as none of the ordinary Greek and Latin roots seem to fit together in an obvious way, but I’ve not yet had the opportunity to read through Simon’s original description, which likely explains his choice of that construction. Your problem about the etiology of Mecaphesa seems to be difficult to solve. I am not sure whether the original description will help you, as at that time neither Simon nor many other arachnologists went to great lengths to explain the origin of their names. I have at home only a Latin Dictionary, and as no help could be found there, it seems that it must have Greek origins – and unfortunately my personal knowledge about Greek vocabulary is just minimal. Concerning your species in the webpage “bugsinthenews” I can only tell that it is absolutely a species in the tribe Misumenini, but nothing more. The ocular area has some kind of transverse pale ridge, although not as conspicuous as, e.g., in Misumenoides formosipes. At this moment I cannot finally exclude the genus Misumenoides and without careful comparison of all epigynal figures (of North American Misumenini) it is not possible to make a final identification, as I have not actively worked with North American Misumenini since the revision of the concept of Misumenops (but rather with still obscure Neotropical species of this tribe and also of some other tribes). Obviously, as Dr. Lehtinen kindly suggested, I have much more work to do before arriving at a firm conclusion on this spider’s identification. He published an extensive set of notes, in European Arachnology 2003, Proceedings of the 21st European Colloquium of Arachnology, specifically on the tribe Misumeneni. I am presently studying this material in hopes it will shed some needed light on the subject. For a good description of the characters that distinguish between the various thomisid genera, the Bugguide website sponsored by Iowa State University provides a thomisid web page that is very useful. Links to contributed photos of various Mecaphesa species on the Bugguide website don’t presently appear to include this species, but it is difficult to be certain, inasmuch as each species varies considerably from one specimen to another. 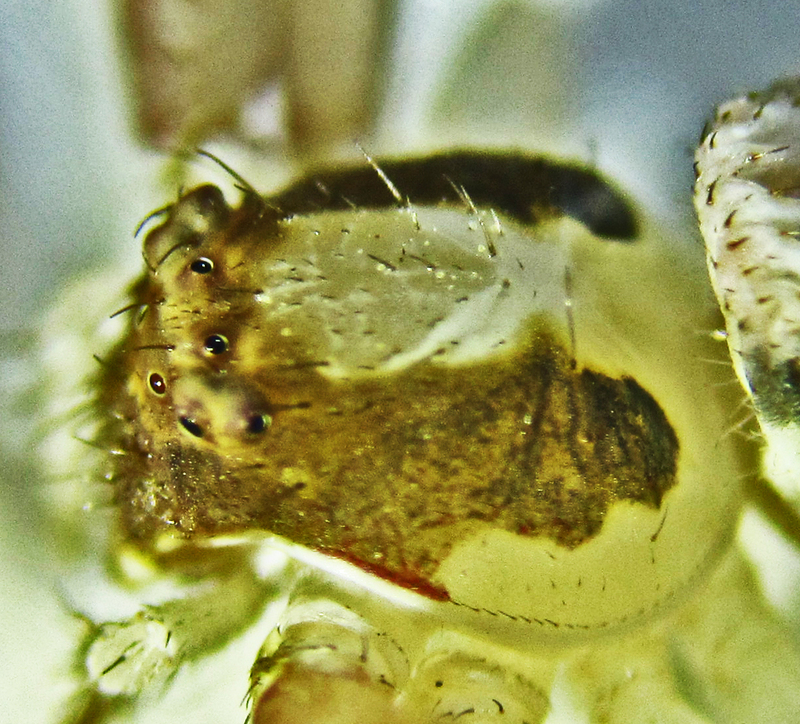 Dr. Schmalhofer points out that the Bugguide website has another link, too, with “portraits” of the various genera of crab spiders typically found on flowers. Anderson, John F., 1996. Metabolic rates of resting salticid and thomisid spiders. J. Arachnology 24:129-134. Comstock, John H., 1912. The spider. Doubleday, Page & Company. Emerton, James H., 1902. The common spiders of the United States. Dover Books. Hillyard, Paul, 1994. The book of the spider. Random House Inc.
Jackman, John A., 1997. A field guide to spiders & scorpions of Texas. Gulf Publishing Co.
Jiménez, Maria-Luisa, 1992. 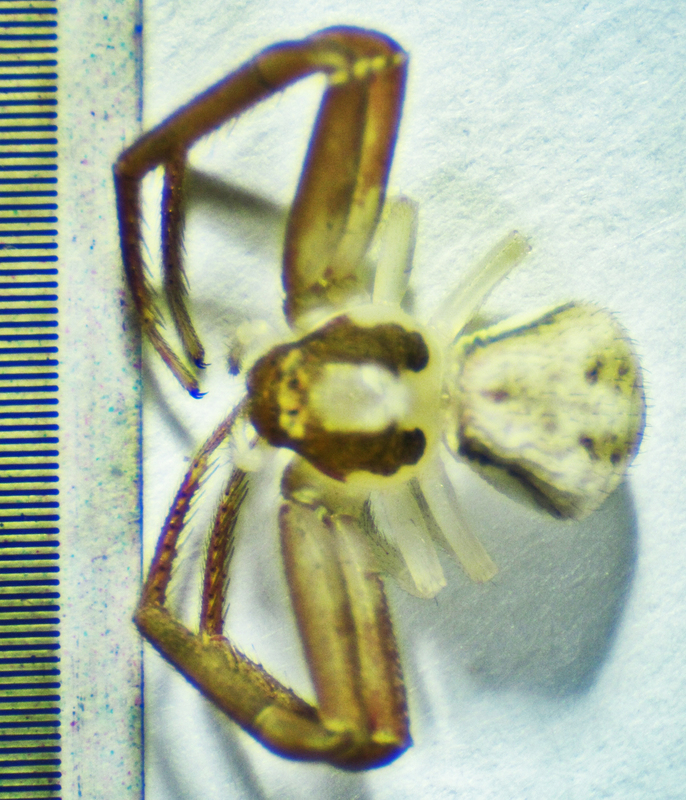 New species of crab spiders from Baja California Sur (Araneae: Thomisidae). J. Arachnology 20:52-57. Lehtinen, P. T. & Y. M. Marusik. 2008. A redefinition of Misumenops F. O. Pickard-Cambridge, 1900 (Araneae, Thomisidae) and review of the New World species. Bulletin of the British Arachnological Society. 14: 173-198. Schmalhofer, Victoria R., 1999. Thermal tolerances and preferences of the crab spiders Misumenops asperatus and Misumenoides formosipes (Araneae, Thomisidae). J. Arachnology, 27:470-480. Schmalhofer, Victoria R., 2000. 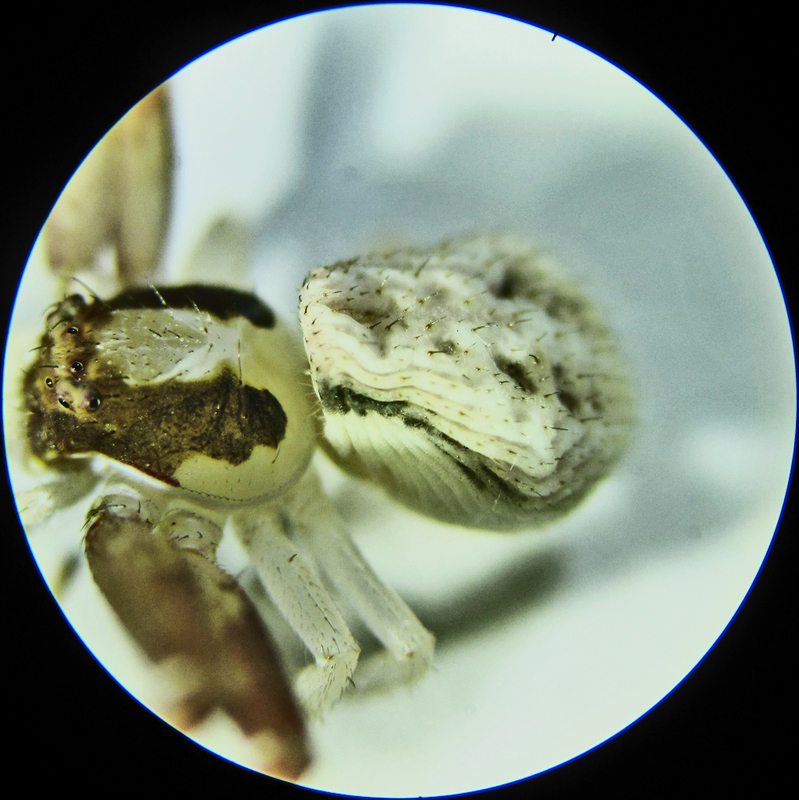 Diet-induced and morphological color changes in juvenile crab spiders (Araneae, Thomisidae). J. Arachnology 28:56-60. — BugsInTheNews is a VIEWER-PARTICIPANT WEBSITE.Questions? Corrections? Comments? BUG ME RIGHT NOW! Telephone Jerry directly at 512-331-1111, or e-mail jerry.cates@bugsinthenews.info. You may also register, log in, and leave a detailed comment in the space provided below.